Add-on Files Included: Layered PSD, Photoshop ASL, Photoshop PAT; Minimum Adobe CS Version: CS. A set of 42 Photoshop layer styles based on materials found on cars and motorcycles. Including metal grilles, textured plastic, leather, tyres, lights and paintwork. These styles have been created for 300ppi and 72ppi with 21 individual styles for easy use at each resolution. Can be used for headline text, buttons, badges, window frames, text boxes, elements for illustrations etc. All styles are applied with one click. Pack includes a read me file with how to install and edit, a .asl style file, two .psd layered files (one at 300ppi and one at 72ppi) and .pat file with the patterns used. If you prefer a thinner border effect for smaller text or objects then you might want to have a look at Automobile Styles 2 . Keywords: automobile, car, chrome, engine, glossy, layer style, metallic, motorbike, motorcycle, paint work, pattern. Best stock graphics, design templates, vectors, PhotoShop templates, textures & 3D models from creative professional designers. Create GraphicRiver Automobile Chrome Layer Styles 51322 style with PhotoShop, Illustrator, InDesign, 3DS Max, Maya or Cinema 4D. 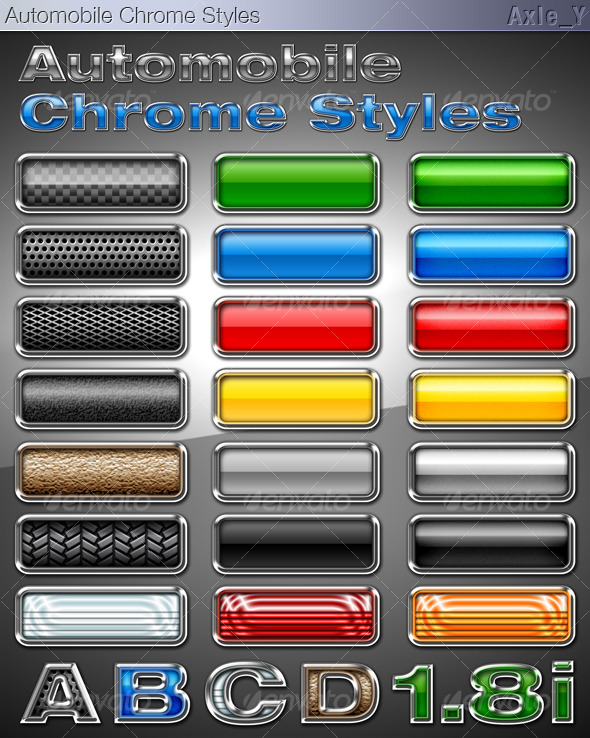 Full details of GraphicRiver Automobile Chrome Layer Styles 51322 for digital design and education. GraphicRiver Automobile Chrome Layer Styles 51322 desigen style information or anything related.